As you can see, nothing is constant in the world of distro rankings and popularity ratings. Mandrake was king of the hill from 2002-2004. 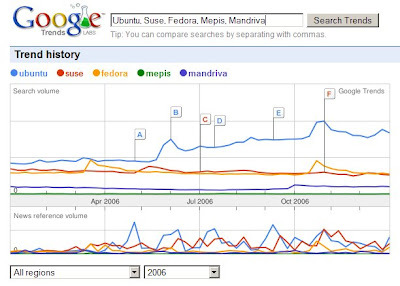 Then, Ubuntu started its dominance in 2005. 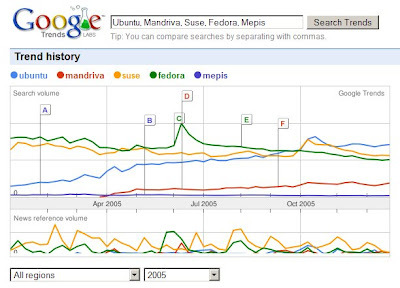 PCLinuxOS was inches away of kicking Ubuntu out of the top spot in Distrowatch ranking in 2007. 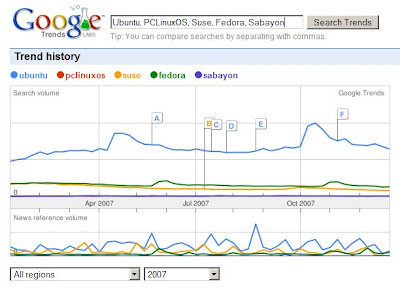 However, it is interesting to note that PCLinuxOS was way below in Google Trends during that year while Ubuntu was really soaring high. So there you have it. I want to know your thoughts about this one. list one time in all those years.! 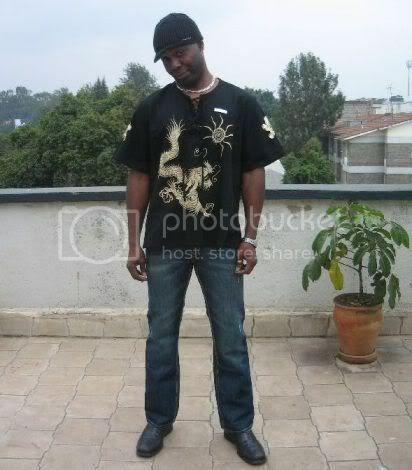 This is a Blogger blog?? Wow, AMAZING theme dude!! I gotta get this...or something similar. Great article though. I'll have to take OpenSuse for a spin. My pal came down from Canada to visit me a week ago here in DSL/Cable-challenged Nairobi and I got her to download the latest PCBSD and SimplyMepis. I can't wait to take those for a spin too. I am a BIG fan of Xandros. I think they're Open Circulation edition could get some more press and nobody even comes close to a giving you a BETTER Windows-like experience than their commercial offerings. Remember, they bought the code that was once Corel Linux which was a distro that was waaaay ahead "back then" in term of ease of installation, hardware detection et al. Had Corel had the financial resources to seriously committ to Linux "back then", the whole landscape would have been a lot different today. They really "flocked up" spending all that money on WordPerfect, which was purchased (or was it the other way around?) from Borland whom also couldn't make a dent in Micro$oft's Office sales. Hey, they tried! My hats off to Corel & Borland for trying to offer Office alternatives. Plus I was also a big fan of Borland's language tools (Turbo Pascal got me started in this field). Seriously, they should just open source Corel Office. It's waaay better than Open Office. Why reinvent the wheel? Anyhow, I'll definitely be back to peek this blog. You're right about this: "the best spot you're never heard of"
The answer to PCLinuxOS question is easy: they've manipulated Distrowatch's page hit ranking. Later, it was just a self-promoting trend. This clearly shows that Google Trends are much more accurate. Thanks a lot for the inspiring comment. I really appreciate it. 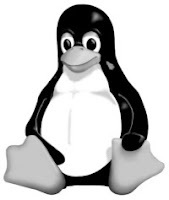 I’m glad that you are also interested in Linux and other open source software. I’ve never tried Xandros but I’ve heard plenty of good things about it and I knew they were very popular back then. Now, it’s Ubuntu’s turn to try to kick M$ a$$. But if Ubuntu will fail, no need to worry because Linux still has plenty of weapons from its arsenal. Anyway, thanks again for being here. I’ll be checking your blog too as soon as I have some free time. I’ve been very busy lately and I’m answering comments via mobile phone right now. 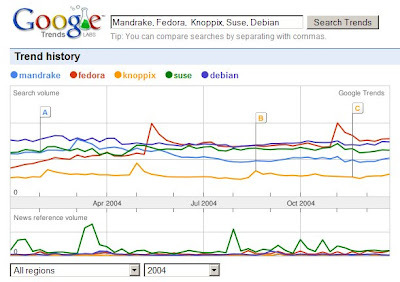 page hit rankings are not indicative of the "popularity of use" of some distro. just because many folks hit some distro's website (or at distrowatch), making it #1, does not mean that that distro is being run on more computers than other distros. i know - i've installed, literally, thousands of copies of "unpopular" distros in corporations - those being SuSE and Red Hat. the rest are mostly "hobbyist" distros. the only exercise I see here is merely for entertainment purposes. regards, mjt - author, Inside Linux.